The pendant lamp Mercury mini sospensione is yet another highlight by Italian manufacturer Artemide. It's the smallest version of the Mercury-family and has its typical features. 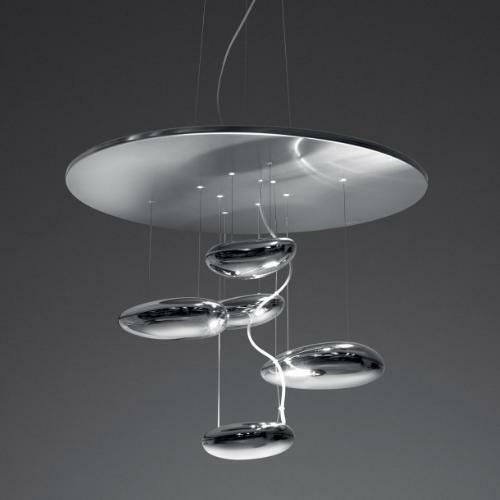 Created by Ross Lovegrove, the lamp is made from a stainless steel reflector from which several silver "drops" are pending. Those drops absorb the light, reflect it and create a mesmerizing display of light and shadow. Mercury mini sospensione becomes a highlight in any room layout, because it always has a shiny surface, no matter if the luminaire is turned on or not, even natural light and other light sources create this great effect.